The greatest catalyst for change in marketing is a quiet sales floor, and the effect this silence has on a business is infectious. Projects are dropped and it’s all hands to the pumps to push prospects through the pipes and generate revenue. The issue is that the change in performance is fleeting, and marketing teams are pushed into making short term, quick fixes that don’t allow for long term growth. Instead, what is required is what we call a perpetual demand engine. This is a full funnel approach to customer acquisition which aims to seed and harvest demand continuously. To achieve this, five core elements of your marketing and the teams associated with them must align. The following are steps to building and fuelling your perpetual demand engine. Moving away from siloed investment and activity, and joining the dots between technology, content, media and customers. At the operational heart of a perpetual demand engine is a stack of technology that enables your business to reach customers with relevant and valuable messages at all stages of their journey, and the ability to understand how customers engage with these messages and the content associated with them. This does not necessarily mean new technology, in some cases it means less rather than more, but in all cases it means connected technology. The most important outcome of this stage is that you are building a software stack that allows for the unobstructed flow of data from the initial first contact a customer has with your brand, through to the final conversion. To reach across all customer touch points the technology needs to include a content management system to host and curate content, media channels to promote content, email automation to nurture leads, CRM to engage with leads and customers, and an analytics platform to measure effectiveness. Syncing these together is a crucial step. Aligning the data that flows through these technologies and stitching it together to extract the value is the key transformational challenge businesses face. Regardless of what technology you’re using there will be central points where multiple sources of data are collected. You do not necessarily need an enterprise level data management platform implemented across your systems to be able to categorise and manage your data effectively. In fact, it all starts with the simple concepts of tracking behaviours, assigning value, and consistency of implementation. You must develop consistent and scalable naming conventions with a tracking module that works across your content, earned media, paid media and email marketing. Ensuring the data is reconciled and visible in your web analytics and CRM gives you insight from keyword to customer to revenue. Marketing content is intrinsically woven throughout the customer journey with different objectives at each part of the funnel. Knowing the when’s, where’s and why’s of your content and is pivotal to achieving its objective within a perpetual demand engine. Offering valuable content that has a broad appeal to a top of funnel audience is the first step in engaging with your customers, seeding demand and supplying sufficient audience numbers to progress through to the next stages of your demand engine. Segmenting this pool of users into distinct audiences based on their preferences ensures that demand is supported with the most relevant mid funnel content focussing on solutions, increasing engagement as prospects become leads. 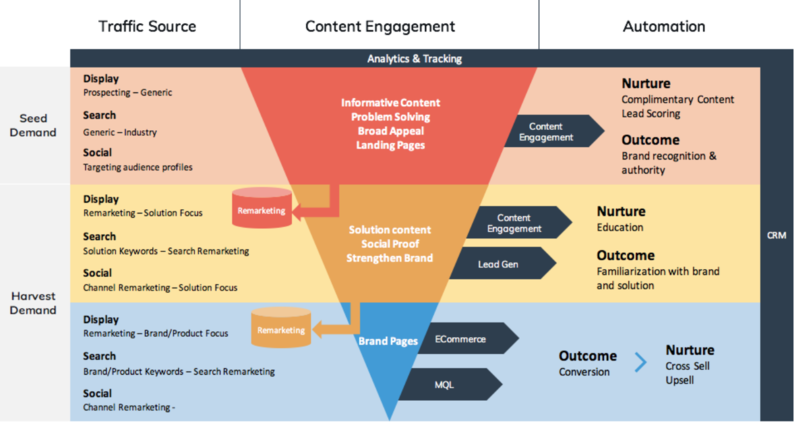 Bottom of funnel content focuses on proposition messaging with conversion optimised content as leads become customers. Your media must support the format and objectives of your content, working hard to ensure it is amplified to reach the right audience and generating demand. Firstly, seeding demand at the top of the funnel to reach a wide but receptive audience of potential customers via display and social media, as well as relating to top of funnel search queries. Then, supplied with valuable cookie pools, retargeting audiences are built based on user behaviour. Customers who are ready to focus on your solutions can be retargeted with mid and bottom of funnel content to harvest the demand. Those not yet in the market are nurtured, retargeted with value add content that keeps your business front of mind for future consideration. Measuring the effectiveness of your media and ensuring that expectations are aligned with outcomes are very important. To expect top of funnel activity to return bottom of funnel results is not a fair demand. Setting realistic KPIs and implementing even rudimentary attribution models can ensure that all media and content are measured appropriately and that optimisation is based on performance related to objectives. The ability to acquire new business by seeding and harvesting demand continuously is very appealing, and that is why more and more businesses are coordinating across teams and technology to undertake digital marketing transformation and deliver the mechanisms and processes needed to implement a perpetual demand engine. This is an ongoing and iterative process but one which allows the potential of digital technology to be realised, enabling powerful, customer centric acquisition strategies that keep the sales floor busy. 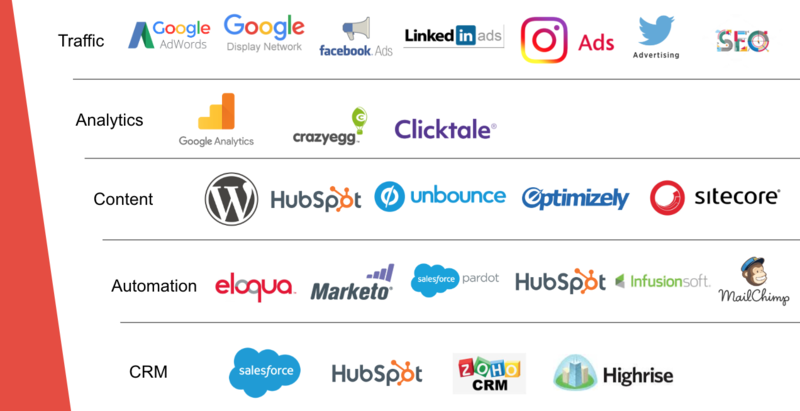 Once you align all of these areas you will be on your way to building a perpetual demand engine that is consistently working for your business to generate new leads throughout your financial year.